Luke Shaw has been rewarded for a strong start to the season with a new five-year Manchester United contract. 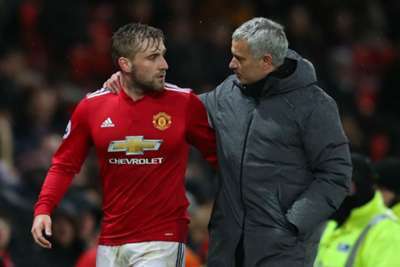 Left-back Shaw has been on the fringes for much of his time at Old Trafford, where he moved from Southampton in 2014, with manager Jose Mourinho singling him out for criticism on a number of occasions. But impressive form in the 2018-19 campaign has earned the 23-year-old a recall to the England set-up and a new deal at United. Shaw started only eight Premier League games last term but has already played the full 90 minutes in seven top-flight matches this season for United, who are eighth in the table. The 23-year-old conceded his progress at United has not always been smooth but said he is positive about the future after bouncing back from a career-threatening broken leg. "I'm very proud and very happy as well. It's been an odd four years for me. There have been ups and downs," Shaw told United's website. "From signing today now it's all about looking forward and to how much I can help the team and become a success again and I'm really looking forward to the years to come. "If you look at my situation in the last year and a bit you'd have thought this could have been impossible, but I worked hard, I wanted to be here and I wanted to make sure that my future was here to help this club." Winning back his United place saw Shaw brought back into the England squad but the former Southampton defender is determined to maintain his performances as Mourinho's men seek to turn around a poor start to the season. "I'm really happy to be in this form and over the pre-season I was working very hard to make sure that I gave myself the best opportunity to be able to put myself in the team, and thankfully I have done that," Shaw added. "The hard work isn't over. I want to stay in the team now and keep the shirt, so I'll keep going, keep focused, keep concentrating and that's what I'm going to be doing. "Everybody knows how big Manchester United is and obviously the success we've had in the years that have gone by, but I think personally it's only a matter of time that the success is going to be coming back. "I can see the team that we have here. We have an amazing group of players and the talent we have is scary, there are a lot of young lads that are hungry for trophies and that's only good for the team, for the club and obviously for the fans too."